December is full of high spirits and good cheer. If you browse online, you’ll find some surprising holidays amidst more well-known celebrations. 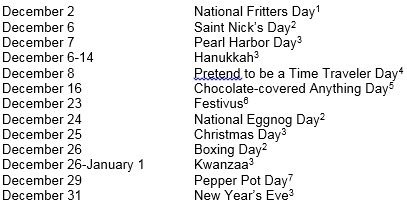 Just in case you need more reasons to celebrate the season, here is a list of major holidays with a few lesser-known ones thrown in – just for fun. No matter which holidays you celebrate, we hope they will be joyous and memorable.